Is Natural in Green Cleaning Products Always Good? In seeking the eco friendly solutions to traditional cleaning products, we tend to assume that if it is natural it must be good. As a result, many seek and use recipes that contain ingredients such as vinegar, baking soda, and borax. As an enhancement some will add their favorite essential oils to the mixture. Similarly businesses will seek to find green janitorial supplies for commercial applications that replicate these green natural home solutions. “Natural” is a product derived from plant or mineral and are in a form similar to what occurs in nature. These materials might be manipulated to put them in a physical form that enables facilitates their use. “Organic” is technically, any substance containing carbon. Both manmade and naturally occurring products may be organic. A common misconception that “organic” and “natural” have the same meaning may cause nontechnical consumers to believe that organic material is natural when it is not. Vinegar is a diluted form of acetic acid. Concentrated acetic acid can be very corrosive causing skin burns, permanent eye damage, and irritation to the mucous membranes. Pure water has a pH of 7 and is neutral whereas anything with a pH less than 7 is acidic and anything with a pH greater than 7 is basic. pH of vinegar depends upon how much acid is present, but most distilled white vinegars contain 5% acetic acid. Even at this dilution level the pH is about 2.4 which causes dermatitis in some individuals and over time will break down the container it is stored in. Additionally vinegar should not be mixed with any alkaline or base, especially bleach. Baking Soda, a.k.a., sodium bicarbonate. As stated in the Fisher Scientific Material Safety Data Sheet, it may cause respiratory and digestive tract irritation. It is moisture sensitive. May cause skin irritation. Causes eye irritation. This is alkaline (a base) with a pH of 8.3. As part of good industrial and personal hygiene and safety procedure, it is important to avoid all unnecessary exposure to this chemical substance and ensure prompt removal from skin, eyes and clothing, as stated in another Material Safety Data Sheet from JT Baker. Borax, a.k.a. boric acid, is classified as a poison because it is lethal if 15 to 20 grams is ingested by an adult, or less than 5 grams by a baby, child or pet. (These are VERY small amounts, less than a spoonful!) In fact it is used as an herbicide and a pesticide. More details. Essential oils are plant extracts and are highly concentrated. The likelihood of allergic reaction is high, especially for those who are known to have hay fever or other plant based, pollen, or grass type allergies. If not used properly they can be toxic and are flammable. In short, no natural or organic ingredient in green cleaning products or janitorial supplies is without risk. Additionally mixing ingredients that are acidic or alkaline (base) ingredients can cause adverse chemical reactions that are dangerous, potentially explosive, and perhaps lethal. With these hazards it is difficult to ensure the safety of you, your children and your pets. Moreover an acid or base is known to etch the surface, even if sealed, resulting in accelerated wear of the material. 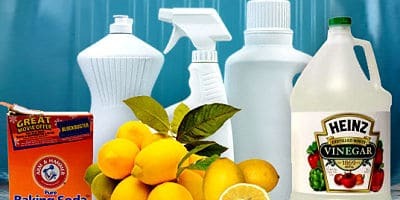 Green Cleaning Products provides a powerful eco friendly and safe green solution to these challenges.